Photo by Tim Kalinowski Cypress County's Neubauer Family, (Mark, Logan, Evi and Nichole), were recently awarded the Farm Family of the Year Award for their dedication to teaching about the agricultural way of life. The Neubauer family has received the 2016 BMO Farm Family of Year Award for Cypress County. 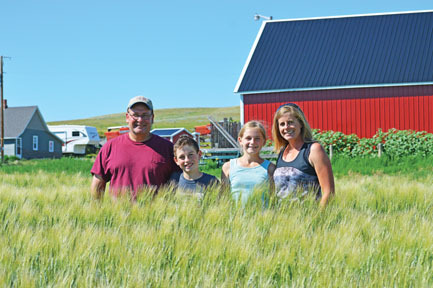 The award recognizes the many years the family has farmed in the area, and its ongoing dedication to educating school kids about the agricultural way of life. The Neubauers began homesteading 10 miles north east of Irvine over a century ago. The original farm remains in the family with a second one added in 1991 just south of Medicine Hat. Mark and Nichole Neubauer, alongside their daughter Evi and son Logan, have since 2009 offered the “Growing Minds Program” to teachers throughout the region. “Growing Minds” is an on-farm education program that teaches students about where their food comes from and the local agriculture industry. Neubauer farms has hosted close to 12,000 students to date. Mark and Nichole also recently took over operations at their original family homestead near Irvine. They are currently in the process of upgrading the nearly century old buildings to bring the farm into a new era. Mark says receiving the BMO Farm Family of the Year Award makes him think about the generations who have farmed before him to try to make a living off the soil and the land. “I think about the tremendous hardship all then families went through when this area was homesteaded. It was complete survival mode in those days, and, in fact, many didn’t survive. We are pretty proud of the fact that have been on this land for so many generations… As far as the Farm Family Award goes, we are pretty humbled by that award, and we would like to share that with the entire ag. community out there,” he says. Nichole adds that she is also thrilled the BMO Farm Family of the Year Award chose to recognize the value of farm education as part of the reason for bestowing the award on her family. “To be recognized for bringing that message to the community, bridging the gap between rural and urban with our agriculture education program… is both very gratifying and very reassuring we are on the right track as agriculture advocates,” she says.